Packing for a long trip or a weekend getaway can be either fun or taxing. Having a go-to pile of travel friendly beauty items is one way to spare the stress of travel. Here are my favorites for when I am jet-setting (unfortunately,no jets involved). First, is a facial mist. This is a must when traveling via airplane. The dry/stale air that blasts through those pesky little vents are sure to wreck havoc on your skin. 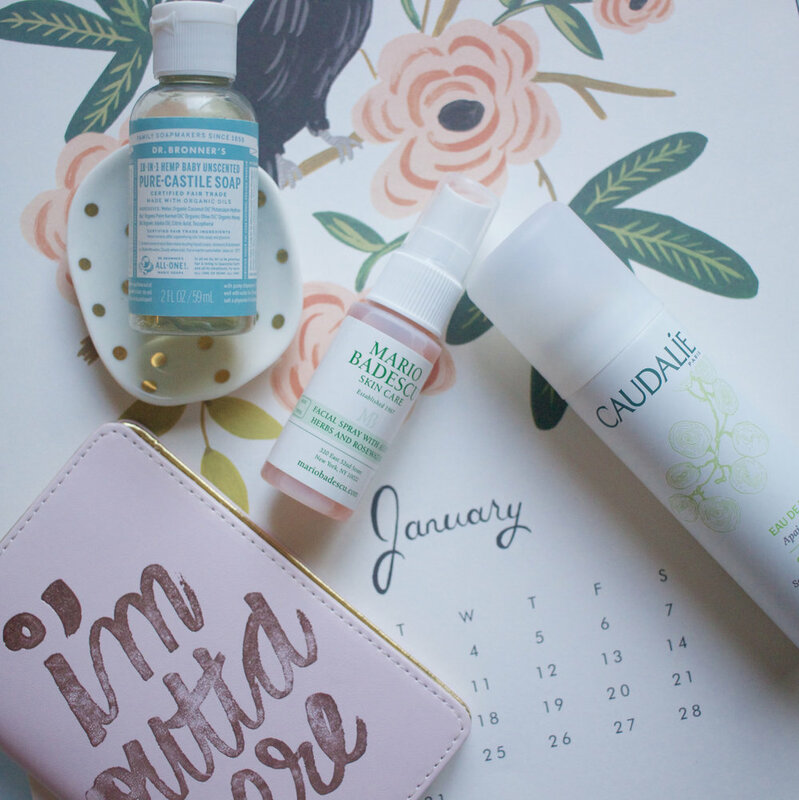 My favorite two are the Caudalie Grape Water and Mario Bedescu Rosewater Facial Spray. Both are brilliant at adding instant hydrating refreshment to your skin. They also double as a makeup setting spray. Cleansing wipes are great for taking off makeup or a quick cleanse at the end of a long road trip. I recently picked up these Burt's Bees Facial Cleansing Towelettes in cucumber and sage. They smell very spa-like which induces a nice relaxing vibe. They are gently enough to use on the eye area in addition to your face and neck. Make sure to get all the air out of the pouch before you seal it shut to avoid them drying out. Dry shampoo is essential for any and all trips. My holy grail dry shampoo is the Klorane Dry Shampoo with Nettle Oil. This super-fine mist leaves my fine hair weightless and clean feeling. The biggest difference between this dry shampoo and many others is that it doesn't have that grit or textured feel. You are able to use this days in a row without product buildup at the root. Buy the 1oz. and it should last you about 20 days of use. HIGHLY RECOMMEND. Dr. Bronner's Magic Soap is a tried and true product that works for your body, face and hair. I personally bring this little guy with me on ALL travel trips because it has many uses. If you forget your face wash/body wash this will come in handy. Or if the body wash in the hotel has a scent your not so keen on, you can use this instead. This non-irritating soap is paraben-free, SLS-free and certified organic. Right now I have the baby un-scented version. The mild-ness of baby one is nice during the winter months. What are your go-to products for traveling?